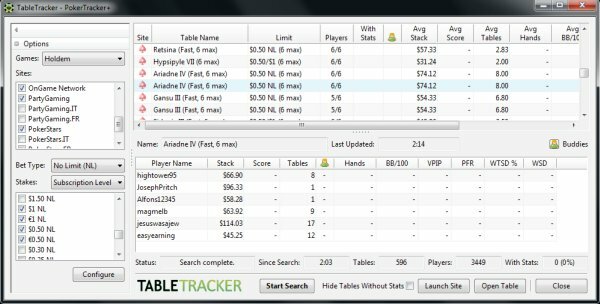 Table Tracker, exclusively available within PokerTracker 4, is one of the most powerful table selection tools available. This service will scan tables at your favorite online poker rooms, cross-reference players against your PokerTracker 4 database, and tell you which tables offer the best action. The information is laid out in an easy-to-read report and you can even set up custom filtering and scoring to keep the results as personalized as possible. Table Tracker is shipped with 25 trial searches and can be unlocked by subscribing to the paid service. One of the keys to improving your win-rate is finding the best possible tables, or as the regulars call it, table selecting. 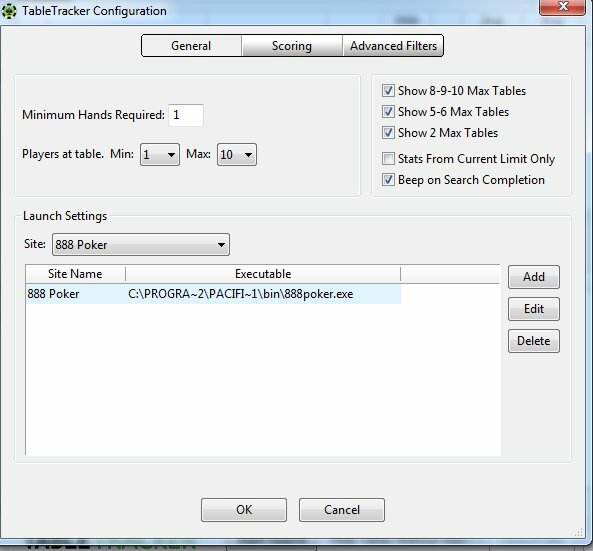 TableTracker is a table selection tool that is an integrated service within PokerTracker 4. It will help you find the best tables to be playing at in order to maximize your potential when you start a session. TableTracker comes installed with PokerTracker 4, so there’s no extra downloading to do, which makes it very convenient to get rolling. Everyone receives 25 scans for free, so you can try it out and actually compare your sessions with and without using the tool. Beyond that, TableTracker uses a subscription-based system with different tiers of pricing. For micro-stakes players, you can use Table Tracker “Bronze” level (up to $0.25-$0.50 No Limit and $0.50-$1 Limit) for $14.99 per month or sign up for a year and get that down to $9.99. The “Silver” level is aimed and small- and mid-stakes players, who can scan up to $2-$4 No Limit or up to $8-$16 Limit games for $24.99 or as low as $15.99 a month for a year. Finally, the “Gold” level lets you scan every level for Limit and No Limit games for $34.99 a month or $22.99 a month when paid for a year. The pricing is pretty affordable considering you are getting access to server-side scanning and you can get the cost really low if you sign up for a year. Below that, you can select your format (Limit, Pot Limit, No Limit, or all) and then which levels you want to scan (defined as the cost of the big blind). Finally, there is a “Configure” button that lets you pick the minimum number of hands required, define the number of players at a table, and define whether you want to show full ring, short-handed, or heads-up tables. The scoring system is built-in using a reliable algorithm to define which tables offer the best action. You can also enter your own custom scoring rules or use none at all. There is also an advanced filters tab that’s quite open-ended and offers many different rules for you to narrow down what you are looking for. If you are a regular and want to find a quick and easy way to boost your win-rate, don’t use an eyeball method to table select. Be smart and use the best resource available, TableTracker. 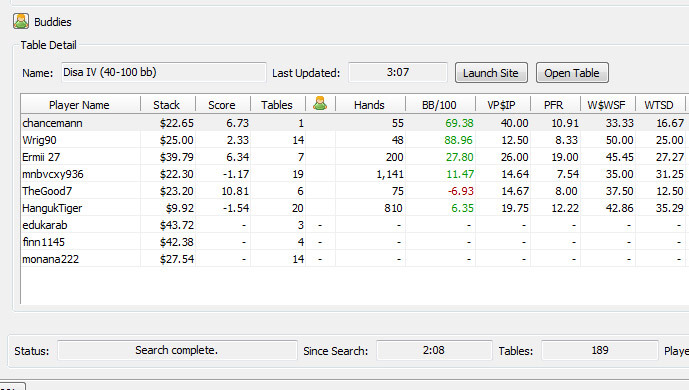 It’s already pre-installed inside PokerTracker, has a ton of features, is easy to use, and offers the most efficient means of table selecting. With 25 free searches, it’s a no-brainer to check out. Chances are you’ll be a paying customer of TableTracker rather quickly.